This article originally appeared on April 18 in the Advertiser News North and Advertiser News South, as well as other Straus News publications. BOSTON — George and Kisha Acevedo of Hamburg went for lunch soon after watching their son pass by the 18-mile mark at the Boston Marathon. 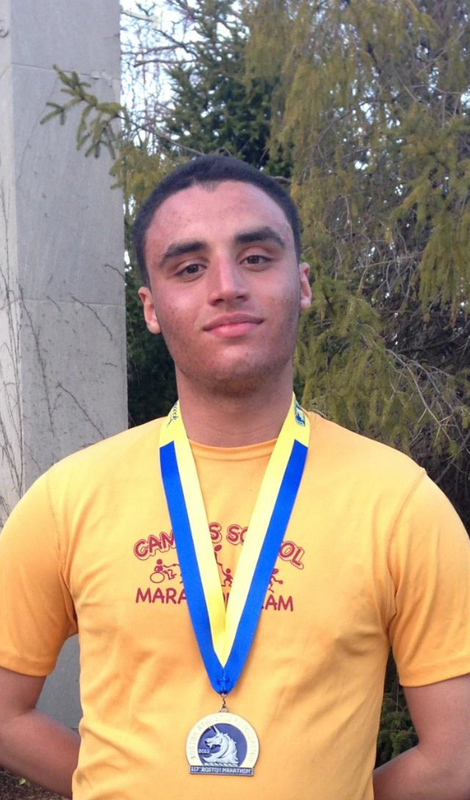 George Jr., an 18-year-old freshman studying computer science at Boston College, had an app installed on his phone that allowed his parents to track his progress throughout the race. During lunch the app stopped working. The Acevedos didn’t know why. After lunch, driving to the Newton Campus where their son lived, the Acevedos turned on the radio. In that moment they experienced every parent’s worst fear. “We heard there was an explosion at the finish line,” said Acevedo. He and his wife began calculating when George Jr. may have crossed the finish line. It was close. George Jr.’s cell phone had died during the race. He finished ten minutes before the first explosion and was resting by the finish line. Runners gathered at the finish line began to realize that something was wrong. “People started stampeding towards him,” said Acevedo. “He got up and he just started running.” The Acevedos didn’t hear from their son until about two hours after the first explosion, when George Jr. was able to use someone’s cell phone to leave a message for his dad. His dad had a hard time describing what it was like to finally receive word that his son was okay. “It was like the greatest thing that I ever…” said Acevedo, choking back tears. “You know, before that I just couldn’t get to him, I didn’t know where to look for him.” Acevedo said he considered forcing his way through the barricades to look for George Jr. but decided against it. “The thing that scared us is that they said there were body parts all over the area,” said Acevedo. His wife made him turn the radio off. Later, at the Newton Campus, the Acevedos were reunited with their son. “We just grabbed him, we just ran up and we started hugging him,” said Acevedo. On Monday two explosions occurred at the finish line of the Boston Marathon. Three people were killed, including an eight-year-old boy, and as many as 176 people were injured. The explosions occurred around 2:50 p.m. According to media reports citing law enforcement officials, the bombs were made out of pressure cookers placed in duffel bags that were left in the spectator area near the finish line of the marathon. The bombs contained shrapnel, according to the reports. President Obama during a press conference Tuesday morning said the FBI is investigating the attack as an act of terrorism.